Certainly one of my most popular recipes on Instagram is chickpea cookie dough. I’ve made countless versions, but this is a pretty simple base recipe that you can use to make a number of different flavor combinations! It’s super easy, and I always just blend mine up in a high-speed blender. I added chocolate chunks, coconut, and crushed pistachios to this batch. This won’t change the taste or texture at all, it just adds some extra protein— good for your hair, skin, nails, joints, and even your gut. I use Further Food and my discount code is FINDINGBALANCE! chocolate chips, chopped nuts, candy pieces, coconut, dried fruit, etc. Blend everything together, except for the pecans and additional add-ins, until smooth. Notes: The dough tends to thicken in the fridge. Add more milk if necessary for desired consistency. If too much liquid is added, more flour or ground flaxseed can be used to absorb it. More flour can also be added for more of a “doughy” consistency. It only takes about 30 minutes to make as well… perfect easy weeknight meal! Blend all ingredients for the cashew cream together in a high speed blender. Adjust liquid to desired consistency, and adjust seasoning to taste. Drain artichokes and lay out on a baking sheet. Drizzle generously with olive oil and season with garlic powder and sea salt. Roast on 450°F for about 30 minutes, until crispy. 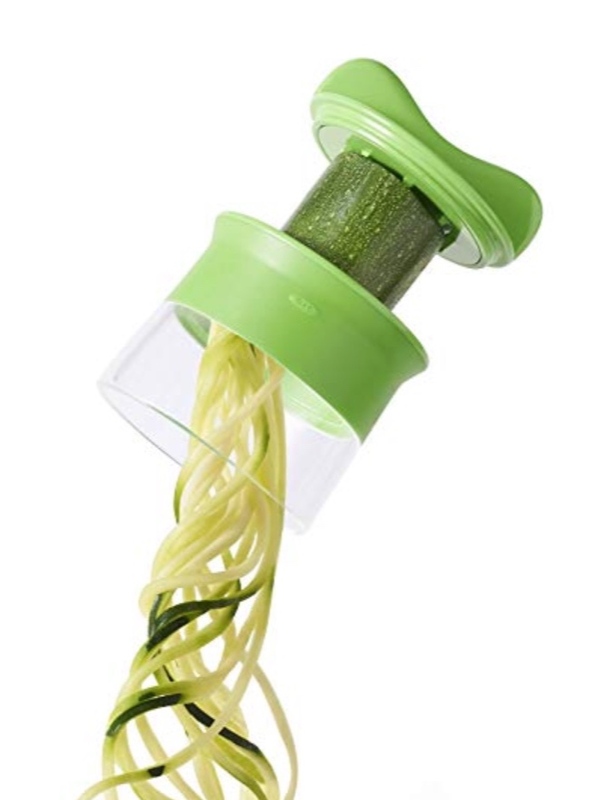 I use this handheld spiralizer… only $15 on amazon! Cook 8 oz. of dry pasta according to the package directions. Wash 2 small or 1 large zucchini and chop off one end. Spiralize into noodles (or “zoodles”) and set aside. After draining the pasta, place the zucchini noodles, cashew cream sauce, and pumpkin seeds into the pan and stir just a little bit to spread out the sauce. Add in the hot, cooked pasta, and stir until everything is warm and well combined. Serve out onto a bowl with a portion of the roasted artichokes and more pumpkin seeds, if desired. Leftovers can be stored in an airtight container in the fridge for up to three days. Enjoy! When I asked my mom to try it, she said, and I quote, “You could literally jar this.” I promise you… it really is THAT good! Blend everything together in a high speed blender and DEVOUR! You can cover and store this in the fridge for up to a week as well, just be aware that it firms up pretty good so you may want to let it sit out for a few minutes when you go back to eat it. A perfect weekend breakfast or the perfect thing to prep for a quick, easy, grab-n-go breakfast during the week, these egg muffins cover all the bases! They’ve got fat, protein, veggies, AND fiber… and they’re absolutely delicious! You can enjoy them all on their own, or pair with fruit, toast, and a warm mug of coffee if you’ve got time to sit down. To reheat, simply pop one or two muffins in the microwave for 30 seconds -1 minute. Heat oil in a skillet over medium head and, when hot, add in chopped sweet potato. Saute potatoes until they begin to soften, about 5 minutes. Add in chopped bell pepper, zucchini, garlic powder, paprika, salt, and pepper, and sauté until soft, about 5 more minutes. Spray a muffin tin with non-stick cooking spray (or fill with paper liners) and divide the cooked veggies & chopped sausage evenly. In a separate bowl, whisk the eggs together (with salt and pepper, if desired) and portion between the muffins. Bake at 350 degrees F for about 10 minutes until eggs are set, adding a sprinkle of cheese on top halfway through. Enjoy warm or allow to cool and store them in an airtight container in the fridge for up to a week! Protein, energy, and fat balls are some of my favorite snacks to have prepped in the fridge. I’ve made so many different flavors and varieties, and the options are nearly endless! These “Strawberry Bliss Balls” are perfect when you need a sweet bite in the afternoon to hold you over. Pulse everything in a food processor until well combined. Roll into balls, roll in coconut flakes, and store in an airtight container in the fridge for up to a week! **TIP: I like to make the balls different sizes, in case I’m more hungry at certain times than others.